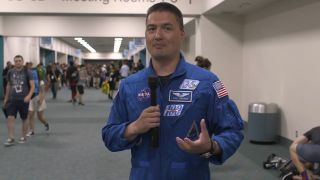 Astronaut Kjell Lindgren was among the NASA employees who visited Comic-Con International in San Diego and cited science-fiction inspirations. From "Star Trek" to science fiction to real-life space, NASA employees paid tribute to the role of inspiration at the Comic-Con International in San Diego last weekend. In a new video, NASA highlighted a series of interviews and panel discussion clips from the convention on how several NASA employees got to where they are today. "I think one of the biggest things we do at NASA, and as human beings in general, is we are pushing boundaries," Amber Straughn, an astronomer at the NASA Goddard Space Flight Center, said in the video. "We are looking to sort of go beyond what is capable right now. I think that's common not only in what we are doing at NASA, but in science fiction." Straughn pointed to the James Webb Space Telescope, which is set to launch in 2018, as an example of pushing those boundaries. The telescope is in part designed to look for small, far away Earth-like planets in a quest to help astronomers better understand habitability. NASA researchers are also searching for life in our own solar system, particularly on Mars. Bobak Ferdowsi became one of the most visible members of the Mars Curiosity team when images of his mohawk hairstyle went viral during the Mars rover's landing in 2012. "I mean, I took the 'seeking of new life' a little too seriously in a career," Ferdowsi said, riffing off an old "Star Trek" line. "Actually, what drew me to 'Trek' at the beginning was really the personal thing, and ultimately I thought being part of NASA was one of the best ways to make that kind of future a reality." Rebekah Sosland Siegfriedt, a systems engineer at NASA's Jet Propulsion Laboratory in California, recalled the 1997 movie "Contact" where actor Jodie Foster receives a signal that appears to come from an alien civilization. The film was a huge inspiration to Siegfriedt as a young girl. Today, Siegfriedt is helping to build the Mars 2020 rover that will search for signals of habitability on Mars. "It's hard to believe a movie like that and a person like Jodie Foster in that movie could have inspired me to where I am today," she said.